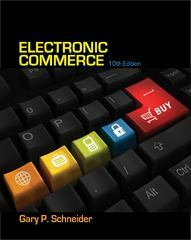 Electronic Commerce 10 Edition E-commerce continues to have a dramatic impact on virtually every aspect of business. And following the 2009 recession on electronic commerce, its role is even more critical. Packed with the most cutting-edge coverage available, ELECTRONIC COMMERCE, 10e equips students with a solid understanding of the dynamics of this fast-paced industry. It delivers comprehensive coverage of emerging online business strategies and technologies in the electronic commerce marketplace. By detailing how the landscape of online commerce is evolving, this market-leading text reflects changes in the economy and how business and society are responding to those changes. Balancing technological issues with the strategic business aspects of successful e-commerce, the new edition includes expanded coverage of e-commerce growth in China and the developing world, social media and online marketing strategies, technology-enabled outsourcing, and the latest development in online payment processing systems.